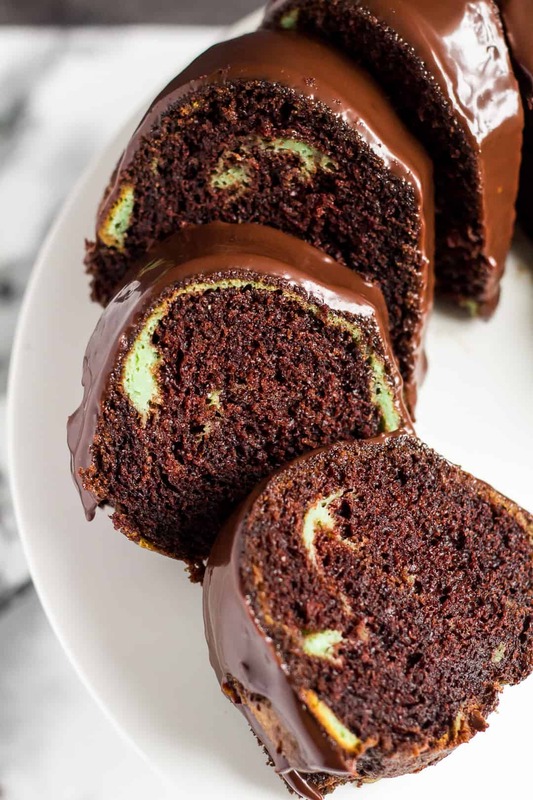 Mint Chocolate Bundt Cake – Deliciously moist and fluffy chocolate bundt cake infused with mint, and drizzled with a creamy chocolate ganache! If you’ve been reading my blog for a while now, then you already know my love for mint chocolate. In fact, I’ve already shared a few mint chocolate recipes with you! See my No-Bake Mint Chocolate Cream Pie, Mint Chocolate Bark, and Mint Chocolate Oreo Fudge. <<< All no-bake recipes by the way. 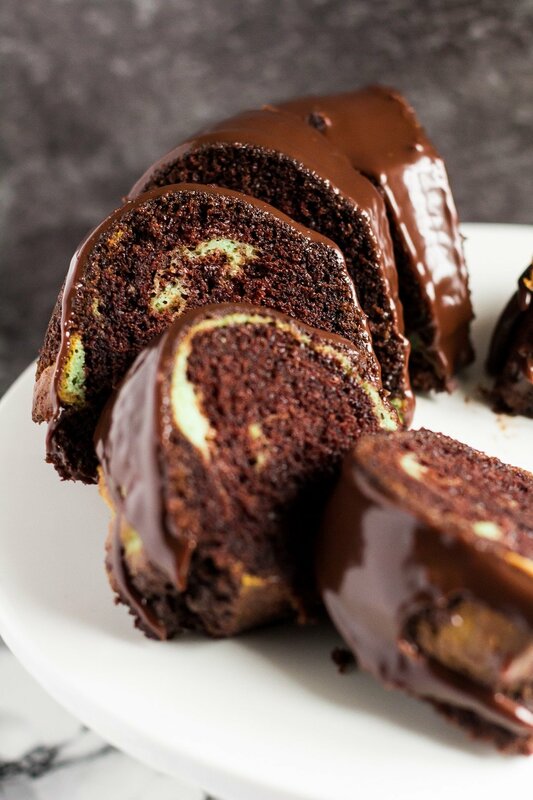 😉 Today I bring you my Mint Chocolate Bundt Cake! Bundt cakes are a favourite of mine to make and serve to my family. They’re easy to make, and they always look impressive. What’s not to love about them?? Topped with the most deliciously thick and creamy chocolate ganache! 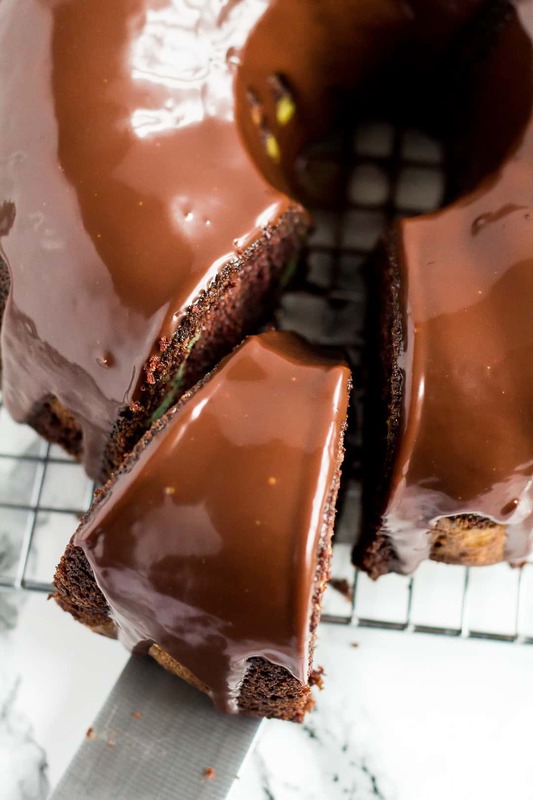 Seriously, this is the BEST mint chocolate bundt cake I’ve ever tasted – you are gonna love it! More mint chocolate recipes to try next! 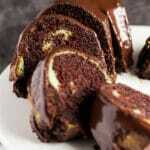 Deliciously moist and fluffy chocolate bundt cake infused with mint, and drizzled with a creamy chocolate ganache! Whisk together the flour, cocoa powder, baking soda, baking powder, and salt. Set aside. Whisk together the eggs. Add the sugar, and whisk until combined. Add the mint extract, oil, and yogurt, and whisk until combined. Fold in the dry ingredients. Whisk together the cream cheese and sugar until combined. Mix in the egg and mint extract, then fold in the flour. Add in enough green food colouring to reach desired colour. Spoon the cheesecake mixture evenly over the cake batter (you don't have to use all of it), then pour the remaining cake batter on top. Bake for 50 - 60 minutes or until a toothpick inserted into the centre comes out clean. Let cool in the pan for 10 minutes before inverting the cake onto a serving plate or cake stand. Allow to cool completely before glazing. Add the chocolate to a heat-proof bowl, and set aside. Add the heavy cream to a microwave-safe jug, and heat until hot. Pour the cream over the chocolate, and whisk until melted and smooth. Leave to cool for 15 minutes before drizzling over the cake. For an even thicker ganache, allow to cool for longer. *Make your own cake flour! Weigh out 2 and 1/2 cups (312g) plain/all-purpose flour, remove 5 tablespoons, and replace with 5 tablespoons of cornflour/cornstarch. Sift well. Mint and chocolate is one of the best flavour combinations. Can you believe I have never had a bundt cake. I need to give this a try. Amazing flavors! We love chocolate and mint. 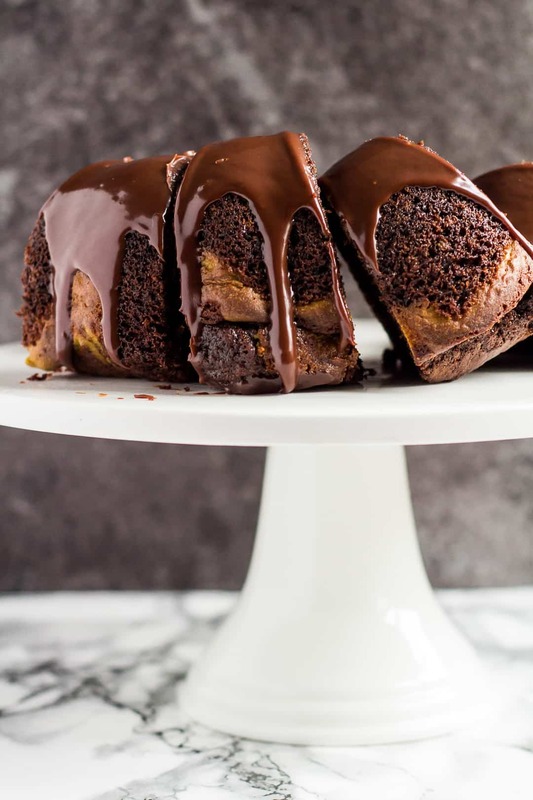 This cake looks so wonderfully moist too! That looks so light and airy! I love chocolate and mint together too! Such a glorious combination! Hi… when adding the cheesecake mixture.. don’t we need to make swirls with a fork or just leave as is and then adding the other half of the cake batter? I leave it as it is, but you could do swirls if desired.